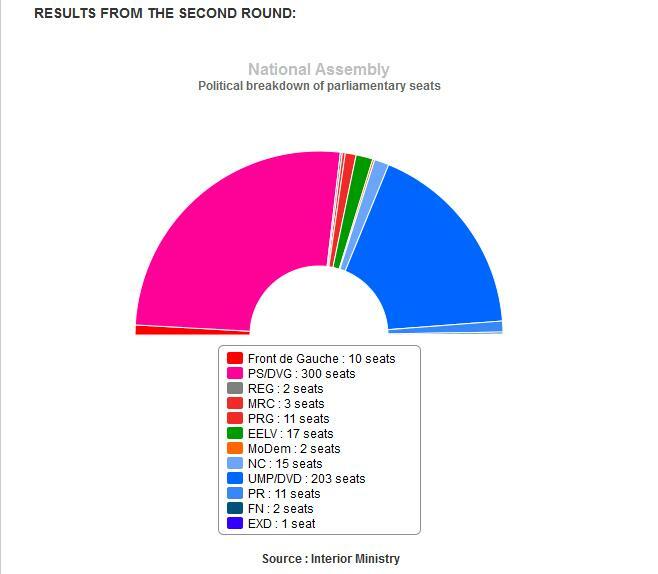 As planned, the French socialist party won the legislatives run-off and even gets the absolute majority with 301 seats (plus the 15 got by the Left Radical Party and the MRC) for the first time of the V° Republic History. The French Socialists will need not the support of the Greens and the Radical Left who got 18 and 13 MPs respectively. As far as the UMP is concerned, it experiences a huge defeat with 210 seats only. Finally, the François Bayrou’s Democratic Movement almost disappears with two seats only and its leader was even beaten in his own constituency. The parliamentary Left largely wins the legislative elections confirming the 6th of May François Hollande victory. The incumbent French president will be able to rule and implement his policy quietly. Nonetheless, if the French Left detains all the powers, it cannot make any mistake as Françoise Fressoz, Le Monde’s columnist, explains. There is a double-challenge for the Left and the Socialist Party: putting the country back on its feet and reforming fairly and not be hegemonic, not to say arrogant in the same time, as the French conservatives were during these last ten years. Maybe the weight and the attitude of the Radical Left and the Greens will be very important to prevent the French Socialists to be out of the reality and remain faithful to the commitments made by François Hollande. Nevertheless, if there is a clear victory of the Left and the Socialist Party, some thorns exist as the Ségolène Royal’s defeat against Olivier Falorni, a socialist challenger and dissident. The former 2007 presidential candidate was to be the next National Assembly Chairwoman and her non-election questions this ambition and also her immediate future. The turnout is another important fact of these legislative elections. Indeed, 44% of French electors did not come to vote, which confirms the second election order of the legislatives as highlights François Fressoz. “Since the presidential mandate was reduced from seven to five years, Frenchs are tend to transform legislatives to a confirmation of the presidential election who took place just before. In 2007, Nicolas Sarkozy got 53.06% of the polls and has 314 UMP MPs elected just after. Five years later, François Hollande got 51.6% of the polls and has 300 socialist MPs elected. The logic is implacable” explains the columnist in Le Monde. 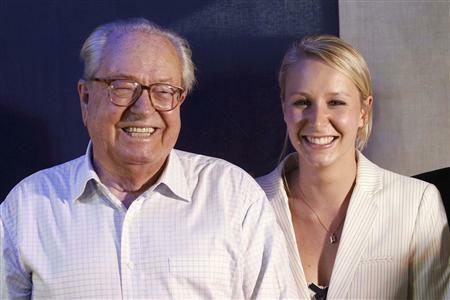 And last but not least, let’s notice the come-back of the Front National in the French Parliament with two seats in which Marion Maréchal-Le Pen, Jean-Marie’s grand-daughter. She is only 22 and becomes the youngest member of the Parliament. Gilbert Collard, the famous and media-friendly lawyer is also elected for the first time and promised to be a “ball-breaker” within the hemicycle.This come-back of the French far-right must be regarded, meaning the Marine Le Pen’s party found its power of nuisance it lost, only five years ago. François Hollande and Jean-Marc Ayrault, his Prime minister can rule quietly and have all the possibilities to implement their policies in a context dominated by a difficult European, international and economic background as the latest Greek parliamentary elections reminded it. As I wrote earlier, the French Socialist Party owns all the powers and has to give results if it does not want to experience the same fate as UMP and Nicolas Sarkozy in 2017, which supposes a big humility vis-à-vis the upcoming challenges. Tags: 2012, 2012 Elections, Far right, France, Greens, Left, MPs, Parti socialiste, Right, UMP. Bookmark the permalink.